Quality management came into practice after the first world war when a need of check the mass production felt so that product could easily be used by the customer. Then after different stages of evolution quality management has arrived its current stage, where it becomes the necessary part of the any organization and helping not only to delivering the quality goods but also reducing the manufacturing cost of goods. 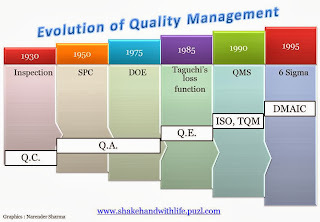 Different stages of evolution of quality management are mention below. 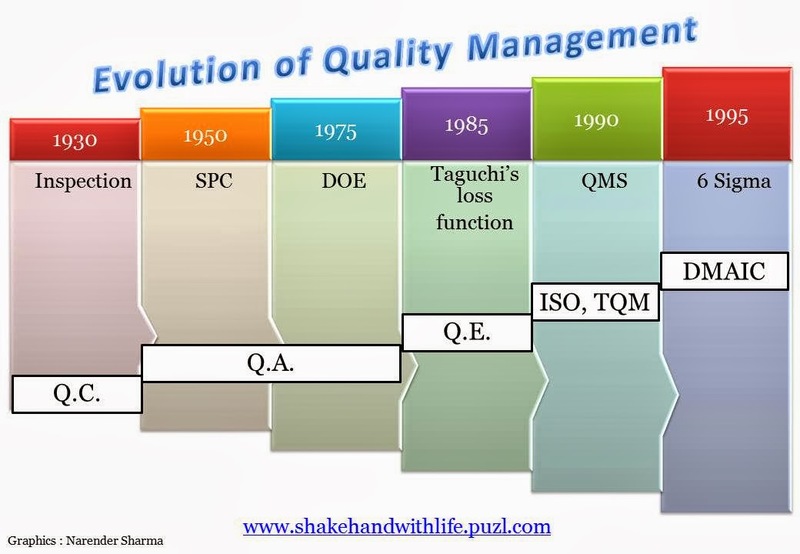 Evolution of quality management was started after the 1st world war with the inspection of mass production in 1930. This was the only method to check the quality of the product by the manufacturer or by the customer. The only objective of the inspection method was to picked out that product which could not be used by the customer, no defect finding criteria was followed. This was the stage of controlling unusable product reaching to the hands of customer. SPC (Statistical process control) was introduced in 1950 to study the variation produced in the product. Collecting data from output and then controlling the process and do it statistically called SPC and it is done by production people. This was the time of Quality assurance. 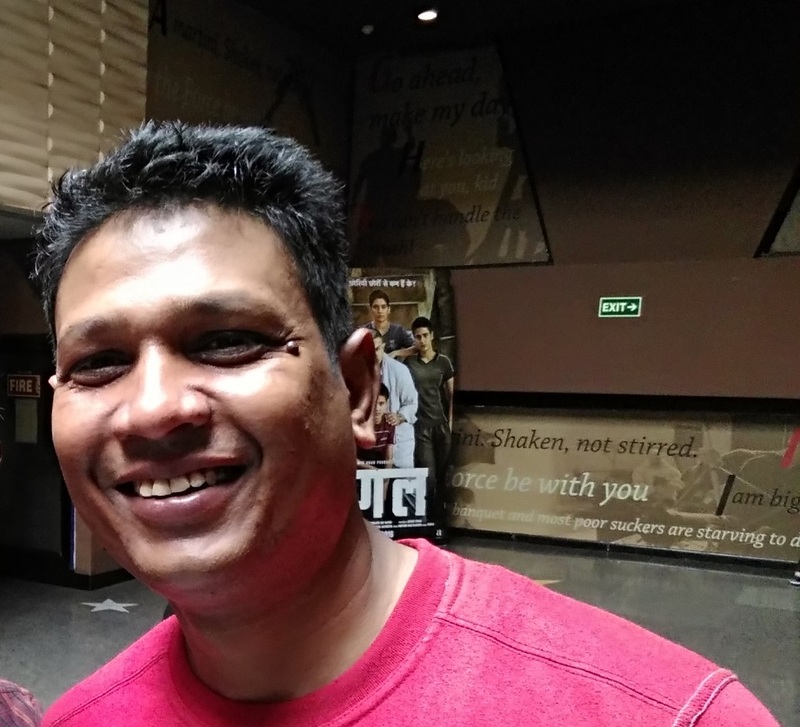 Any product made by some input raw material and through specific process but many a times the output or the product might not fulfill the expectations of customer, the factors which made a product unacceptable to the customer called variations. These variations aroused due to some common causes or some special causes like temperature, pressure, lights, humidity, experience of the people, skills, technology, etc. 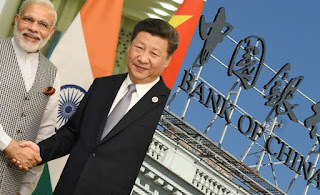 After certain specific limits the variations in the product not accepted by the customer and these limits are lower specification limit and Upper specification limit. The study of these variations came under the SPC. In SPC we got understand that the flaws came in the output or the final product might cause of the different variation in the process or the input. When we study impact of controlling factors in process on output individually, then we are designing an experiment, this is called the DOE( Design of Experiment). what impact of A has on Y and how strong it is? What impact of B has on Y and how strong it is? What impact of C has on Y and how strong it is? DOE is research nature and done by R&D people. 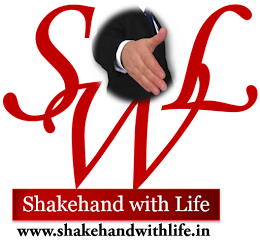 This is a special way of improve the process and requires people with special knowledge. Out of specification is the common measure of quality loss. Although this concept may be appropriate for accounting. It is a poor concept for all other areas. It implies that all products that meet specifications are good, whereas those that do not are bad. From the customer's point of view, the product that barely meets specification is as good( or bad)as the product that is barely out of specification. It appears the wrong measuring system is being used. The loss function corrects for the deficiency described above by combining cost, target, and variation into one metric. TQM and ISO 9001, both system accepted as management guide lines for smooth functioning of quality management system within the organization, organization deliver good products to satisfy the customer, but both system did not directly control the quality because the systems didn't really touch the bottom line of the company or the profits of the company, reason was these systems were presented in philosophies not as tools and so these didn't impact the profits of the organization. Hence some organization start looking towards 6-Sigma along with following TQM. In 1995 when Motorola corporation and GE showed a huge amount of saving with help 6-Sigma methodology, 6-Sigma became the most popular tool of quality with in a short span of time. This because, 6-sigma impact the bottom line as, it is conceived, planned , implemented and executed in a special way. No 6-Sigma project is started unless it do not touch the bottom line or increase the profit margin of the organization. When audit is being done organization must say that really we have huge saving from this project. Six Sigma projects commit to deliver defective product as low as 3.4 in per million. After came into existence quality management has reached at its current level through different philosophies, methods and tools, and continuously evolving with regular changes in manufacturing and service sectors with increasing demand of suitable product by the customers, cost saving and on time completion of the targets. The time has come when none of the existing organization can survive without managing quality. Narender Sharma, is working as quality professional in a leading container glass manufacturing organization.